The product we employ is 100% organic and natural. Further, it is 25(b) exempt by the EPA, which means it is a pesticide with the "minimum risk" as defined by the EPA (to learn more, visit the EPA website). Applications are made every 4-6 weeks. This product and its process have proven efficacy in fighting ticks and mosquitoes. Our clients are raving about how much this product is helping them protect their families and animals. Mosquitoes transmit: Zika virus, West Nile Disease, Dengue Fever & Chikungunya virus, all spread from bites (to learn more please visit the CDC website). 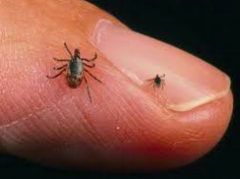 Ticks transmit: Lyme Disease, Rocky Mountain spotted fever, Anaplasmosis, Babesiosis & Ehrlichiosis all spread from bites (to learn more please visit the CDC website).